Act it Out! - Guided group work and drama activity, designed to help students bring this dramatic scene of Banquo’s appareance as a ghost to life, and to facilitate a critical engagement with this scene in terms of building up tension, the presentation of conflict, drama, and characters in the play. 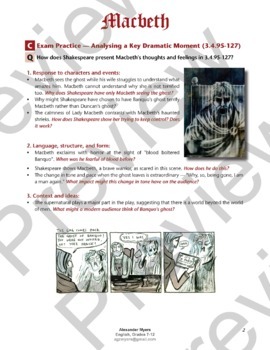 Guided Analysis & Exam Practice: A close reading and language analysis and commentary exercises, which can function as IGCSE exam practice, IB exam practice, or simply as a close reading activity to facilitate guide students in their analysis of the language and dramatic development of the scene. 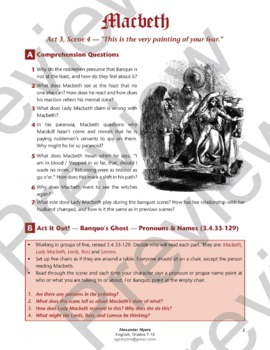 MODEL ANSWERS for all the questions + activities as well as a teacher’s guide and further in-depth analysis and commentary of the Act 3, Scene 4. 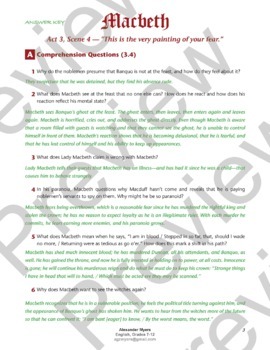 This worksheet, as indeed all of my Macbeth handouts and activities are specifically designed to be read at IGCSE level or in preparation for the IGCSE English Literature exams. But they can be used independent of these exams and the IGCSE curriculum, too, of course! 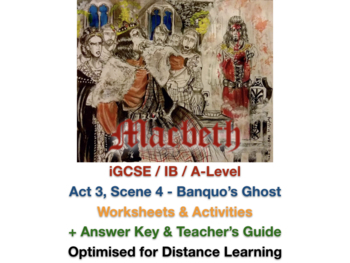 The level is certainly also high enough to be used if you have made Macbeth one of the set texts for your IB English A: Literature or English A: Langauge & Literature course. Enjoy, and please leave feedback!